For automatic banding of product piles and rows of product piles – the ideal solution behind folding machines with shingle delivery and on guillotines. The machine is equipped with an integrated feed pusher, packet recognition, pneumatic compression of packets and a simple touchscreen-operation. Banding is performed with coated Kraft paper tape or polypropylene foil. The machine is mobile on four castors and suitable for variable applications, available for delivery to the right or left side with optional 180Â° roller delivery or straight roller delivery in two different lengths. A high efficiency is achieved due to automatic feeding of the product piles. The Inline Bander with automatic feeding and alignment is directly connected to machines with product pile delivery. 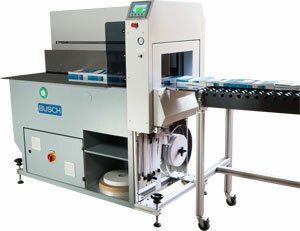 Product piles of all types are banded for example behind gang stitchers with three-knife trimmer and stacker. Equipment includes an integrated feed pusher, packet recognition, multiple packet alignment, pneumatic compression of packets and a simple touchscreen-operation. Banding is performed with coated Kraft paper tape or polypropylene foil. The delivery is optionally selectable with 180Â° roller delivery or straight roller delivery in two different lengths. The space requirement without delivery is just 1.0 mÂ². A notable high efficiency is achieved due to automatic feeding of the product piles and the possibility of integration into existing plants.